Twice protected when facing extreme conditions. 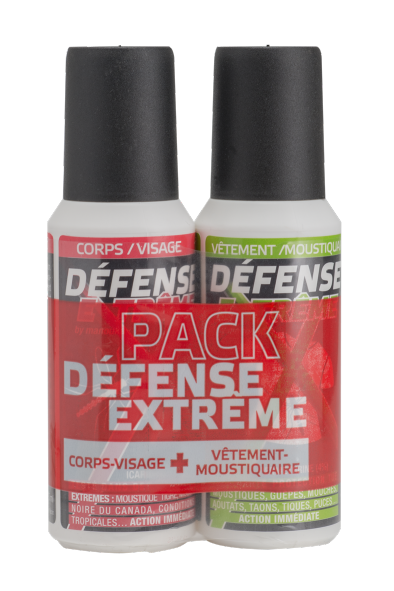 The extreme defense pack was developed by Manouka in order to offer an effective solution for each extreme situation. This pack was designed for: travelers in infected areas, for the ones sensitive to mosquitoes, for different situations (hunting situation, fishing…). These two products are adapted to tropical climate. Vials of extreme defense pack are tested to resist to any type of pressure without any leakage and fit in case of air transport. Efficiency clinically proven by the cage test. The Lotion is to be used directly on the skin (face and body), its non-greasy texture, soothing and moisturizing ensures up to 11 hours of protection against all mosquito species, particularly those carrying chikungunya , dengue or malaria. Almost 40% of mosquito bites are through clothing. This is the reason why Manouka decided to create a spray designed specifically for clothes, and mosquito nets that can be applied on evey type of fabric, and provides you with a full protection.